Release date: 23rd May 2016. Source: Canelo via ED public relations, e-book review copy. 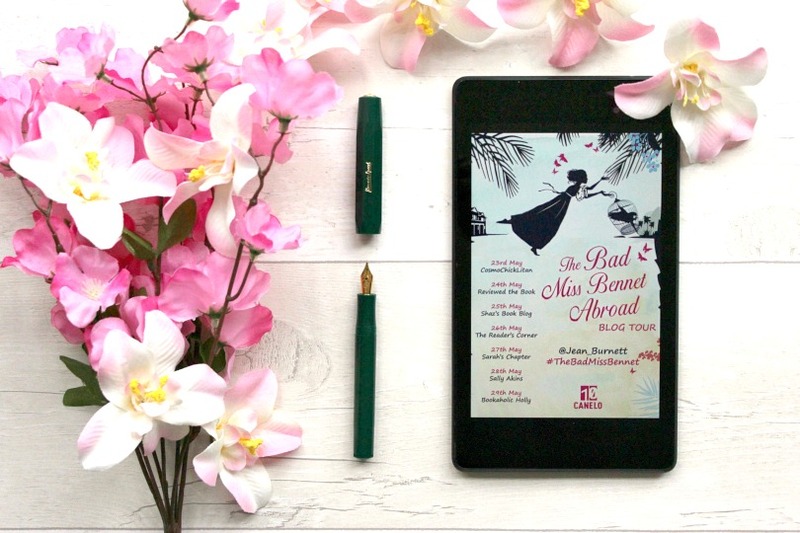 Welcome to my stop on the blog tour for the recently released The Bad Miss Bennet Abroad by Jean Burnett! I'm thrilled to share a guest post from Jean on the enduring appeal of Jane Austen, something which is very close to my heart as an Austen fan! (You can read my reviews of some of Austen's works here and here). So grab a cup of tea and enjoy Jean's post! What is the enduring appeal of Jane Austen? We live in the age of the Janeites, fanatical followers of Jane Austen who have helped to put her novels up there with Dracula, the Bible and other unlikely titles as the most read, loved and copied in various forms. The term Janeites was coined by Rudyard Kipling, a great admirer of the novels. He wrote a long short story called The Janeites, set during the First World War about a group of soldiers who discussed Janes work in the trenches as an antidote to the horrors around them. They even named some of their big guns after her characters. Today people all over the world, but especially in North America, proudly call themselves Janeites. The recent two hundredth anniversary of the publication of Pride and Prejudice, has increased the urge to be Austentatious, fuelled by more and more TV and film adaptions of the novels – and originally, of course, by Colin Firth in that wet shirt. There was a film out recently called Austenland in which a Janeite indulges her ultimate fantasy and disappears into a Jane Austen theme park dressed appropriately. Are the thousands of spinoffs a tribute or a curse? The fact is that writers have been appropriating Jane’s characters since the first spinoff novel was written in 1913. Old Friends and New Fancies by an American writer, Sybil Brinton, mixed up characters from all the novels and married them off neatly - Georgiana Darcy from P and P marries William Price from Mansfield Park. Since then, the tendency has grown into a minor industry. The recent 200th anniversary celebrations of the publication of Pride and Prejudice saw a number of well-known writers producing modern versions of the novels. Joanna Trollope has tackled Sense and Sensibility. Has the Queen of the Aga Sagas introduced one of those beasts into Barton Cottage? I recall that it certainly needed one. Alexander McCall Smith has re-written Emma for the modern age and Val McDermid has published a modern Northanger Abbey set in Windsor rather than Bath. P.D.James wrote a spinoff (Death Comes to Pemberley), which was shown on TV. Today, Jane’s heroes and heroines are much more intrepid, battling aliens (Pride and Prejudice and Sea Monsters), doing time travel and going Bollywood. Women love to compare themselves to Jane's heroines and this is part of her enduring appeal. They were doing the same thing in the Regency era. The Prince Regent's unfortunate daughter, Princess Charlotte, apparently compared herself to Marianne Dashwood in Sense and Sensibility. Perhaps the most obvious and well known modern take on an Austen heroine is in the Bridget Jones novels and films. Although Bridget has a lowly job in a publishing house her principle concern in life is finding the right man. In this she matches an Austen heroine, but while there very good practical reasons for this obsession in the 1800s - no other option being available to women, the situation hardly applies today. Feminists will despair but women are still brainwashed from birth about the necessity of looking good and finding a man. We lack a modern day Almacks, the ballroom where the fashionable elite (the ton) met to find partners, but we have internet dating! Today's heroine haunts bars and drinks to excess but the search for a good man with the equivalent of £10,000 a year goes on. Would Jane spin in her grave over this or would she be excessively diverted? We can never know; but it is a truth universally acknowledged that we need our Austen characters more than ever. We project our hopes, fears and fantasies on to them - and we love them. The Bad Miss Bennet Abroad is a hilarious take on the life of Lydia Bennet after the events of Pride and Prejudice. It's a fast-paced romp through Brazil and beyond and I found it really interesting to see well-loved characters like Darcy and Elizabeth through the eyes of flirtatious, spoilt Lydia Bennet! Jean Burnett has a great writing style and I'd definitely recommend this along with her other books if you're looking for an alternative take on the Austen world. The Bad Miss Bennet Abroad by Jean Burnett was published on 23rd May by Canelo Books, priced £3.99 in eBook.